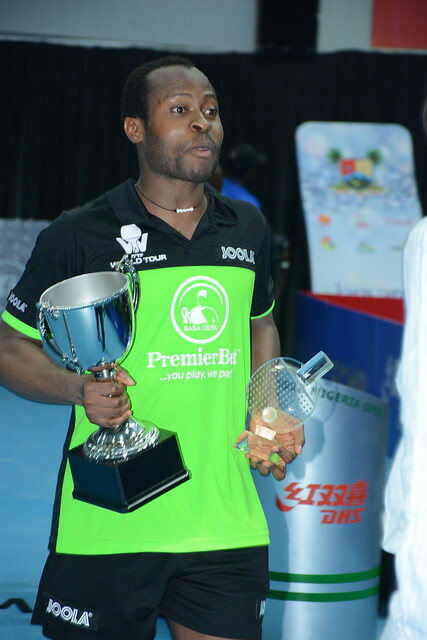 Sunday 12th August marked the final day of the 2018 ITTF Challenge Seamaster Nigeria Open in Lagos and you can relive all of the big moments with our review of the action. Starting off the day’s programme were the two semi-final encounters in the Women’s Singles event as the number of Chinese title hopefuls was reduced from four to two. Sun Chen recovered from a three games deficit to see off Fan Siqi in a thrilling seven game duel (8-11, 9-11, 4-11, 11-8, 11-3, 11-8, 11-6) to seal her spot in the final along with Guo Yan, who required just four games to negotiate her fixture against Wei Wensheng (11-4, 11-9, 14-12, 11-4). Both of the penultimate round matches in the Men’s Singles event drew to decisive conclusions as Nigeria’s Quadri Aruna and France’s Antoine Hachard successfully came through their respective encounters against Supanut Wisutmaythangkoon (11-9, 14-12, 11-9, 11-8) and Gavin Rumgay (11-8, 11-6, 11-4, 11-7) without dropping a single game between them. With the semi-finals action completed the attention shifted to the first final of the day as two partnerships from China met in the Women’s Doubles title contest: in a one-way encounter, Qi Fenjie and Sun Chen accounted for fellow qualifiers Fan Siqi and Guo Yan in straight games (11-3, 11-4, 11-6). Last year in Lagos the Men’s Doubles trophy was awarded to a combination representing France and in 2018 the outcome was repeated with the unseeded pairing of Alexandre Robinot and Joe Seyfried proving too strong for the fifth seeded mixed association duo of Hungary’s Tamas Lakatos and Finland’s Benedek Olah (11-3, 11-7, 5-11, 11-6). Just the two singles finals remained, the first of which was an all-China affair between Sun Chen and Guo Yan. Pulling off a massive comeback effort earlier in the day but in the final it was a different story for Sun Chen. Guo Yan emerged victorious across seven games (7-11, 11-6, 11-5, 7-11, 9-11, 11-4, 12-10) to claim her second title in successive days having also prevailed in the Under 21 Women’s Singles event. Surely the biggest cheer came in the final contest of the day as Quadri Aruna fought back from a two games to one deficit to beat Antoine Hachard in six games (11-13, 11-3, 8-11, 11-7, 11-5, 11-7), becoming the first host nation player to win the Men’s Singles crown at the Nigeria Open since the tournament’s formation in 2014.